Don’t miss this magnificent final chapter in the breathtaking Shadow Falls series! Kylie’s epic journey is about to lead her exactly where she belongs…. When Kylie Galen entered Shadow Falls Camp, she left her old life behind forever and discovered a world more magical than she ever imagined. A place where you’re two best friends can be a witch and a vampire… and where love doesn’t happen the way you’d expect. When Kylie’s most powerful enemy returns to destroy her once and for all, there’s only one way to stop him - to step into her full powers and make a stunning transformation that will amaze everyone around her. But her journey won’t be complete until she makes one final choice: which guy to love. Should she choose to the werewolf who broke her heart but will give anything to win her back, or the half-fae who ran from their attraction before they had a chance? Everything she’s learned at Shadow Falls has been preparing her for this moment - when her fate will be revealed and her heart claimed forever. 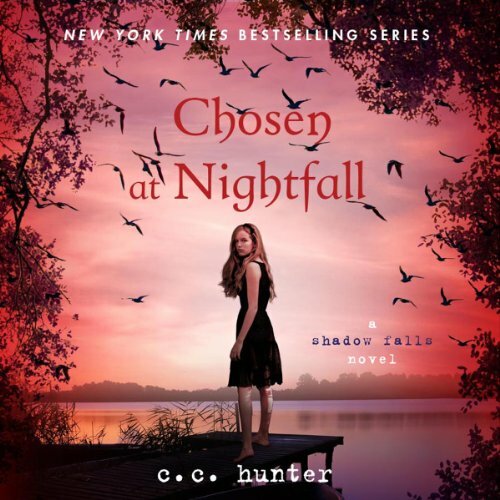 From author C. C. Hunter comes Chosen at Nightfall, the final book in the New York Times best-selling Shadow Falls series about a camp for paranormal teens. Best series since Twilight and Harry Potter! If you could sum up Chosen at Nightfall in three words, what would they be? Kylie, Della and Miranda make a great combination! Very emotional book. Made me laugh and cry. This whole series was great. I have listened to her before and I think she did a great job. I didn't want to stop listening to it. I have loved the entire series. I'm sorry that it has to end. I'm going to miss these characters, but I just saw that there is a spin off series, so I'm going to give that series a go. I enjoyed the world of Shadow Falls and the characters. This was another great performance and I can't wait to hear more. So much happens in this book that you can’t put it down. Love it. Great read. Love the series! They stuck with the same person narrating the whole time which was great because I’ve read some series where they switch people too often. Loved the accent the narrator had because it felt realistic. The narrator does a great job reading a wonderful series. I have read and listened to the Shadow Falls series multiple times. Love the book, but the narrator is sometimes cringe worthy.. I love young adult books and this series was amazing. One problem. I felt like my ears were bleeding from LISTENING TO THE NARRATOR SWALLOW CONSTANTLY. It LITERALLY made my ears hurt and I contemplated buying the actual book instead of listening. It was disgusting and she does it throughout the ENTIRE book. I feel like this last book felt a little forced and drawn out. I had to put it down for a few month and then come back to it. Tolles Ende dieser schönen Serie. Ich habe dieses Hörbuch verschlungen, und kann es nur weiter empfehlen.Die Sprecherin ist toll und bringt die verschiedenen Charaktere super rüber.